For the second day in a row, air quality in Evansville deteriorated to “unhealthy” levels and still no alerts. What goes here? Actually the level got all the way to 45.3µg/m3 at 8 PM last night which was the warmest day of the year so far so we can be assured that people were outside, including kids vigorously exercising and subjecting themselves to a wide array of health issues that exist when air quality reaches those levels. 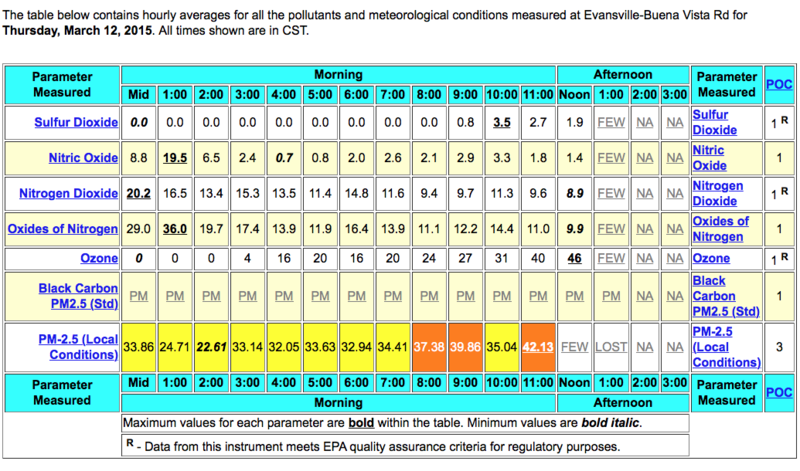 So once again the brain trust at the Evansville EPA and IDEM failed to notify the public with an air pollution alert as the air thickened today in Evansville. On the eastside it was worse than downtown and I did not drive to the northside where the monitor is located. Here is a screen shot taken from the monitor page a few minutes ago which shows the levels exceeding the weak 24 hour standard but if you were out today, you know it was not a good day to breathe in Eville. I am left to wonder if those who are paid well to protect us give a crap about that and are only engaged in protecting the polluters. This entry was posted in Uncategorized and tagged air pollution, Evansville, Evansville EPA, fine particles, IDEM, Indiana. Bookmark the permalink. 1 Response to UPDATE: SECOND DAY of “Unhealthy” air but no alerts. A situation far too common in Evansville and we deserve better.